Chaiya Jema was arrested for allegedly stealing a company safe full of cash and gold. A Nongprue man who complained his employer made him work too hard was arrested for allegedly stealing a company safe full of cash and gold. 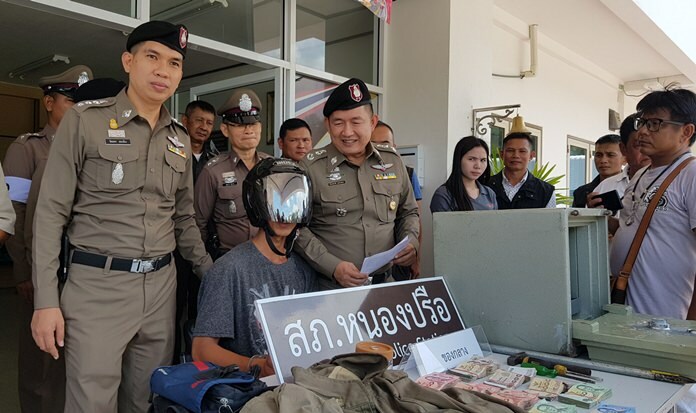 Chaiya Jema, 30, was apprehended April 19 at an apartment in Nongprue’s Moo 12 village with 181,770 baht in cash, gold rings worth 14,000 baht and the stolen safe. Sutisa Suthwaree, 23, manager of the Carry Express Thailand Ltd. off Highway 36 in Pong, called police, who reviewed security camera footage that showed Chaiya using tools and a forklift to break into the safe, which he decided to keep. Police said Chaiya confessed, complaining he stole the safe because his employer made him work too hard for the low salary paid.